I am a techno geek. I love gadgets. Particularly computer gadgets. I’m old enough to remember life without computers, but I still can’t imagine how we got along without email. I think that TIVO is one of the most amazing life changing developments. I know there are a million bigger more important things. I’m just talking about things that rock my little corner of the world. The iphone is another such life changing gadget. Apple does it like no other. They continually put out a great product that simply works consistently and then they add beautiful design to it. Yes, there are other smart phones but they aren’t as intuitive or as pretty. Yes, I love my iphone. And yes, I have ordered my ipad and am waiting for it to come. In 2006 I launched my first CD. 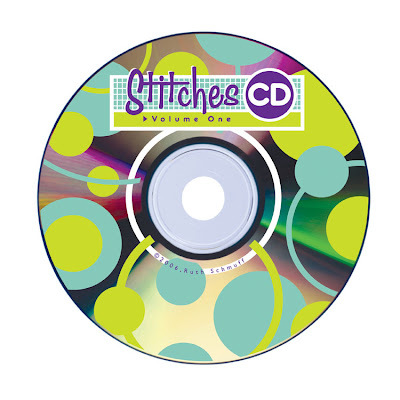 Stitches CD Volume One. 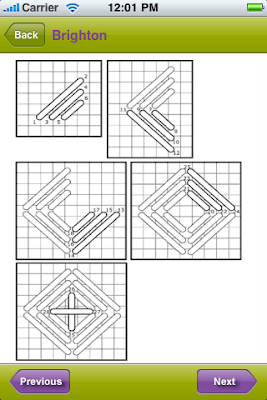 300 stitches organized both alphabetically and by stitch type (Straight Stitches, Diagonal Stitches, Crossed Stitches, Decorative Stitches). You can browse through them and print out just the stitches you need for a project or since they are all pdfs, simply copy them to your laptop and you have your stitches with you 24/7. No extra book to carry! 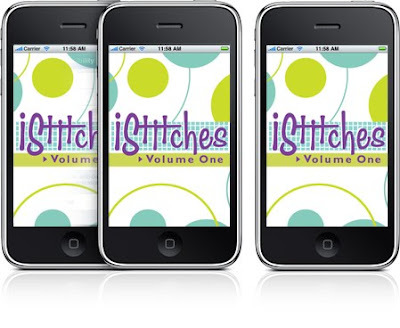 So, of course the next logical step for the Geek Queen was to transform Stitches CD Volume 1 into an iphone app. I’m pleased to announce it is available in the app store!!! 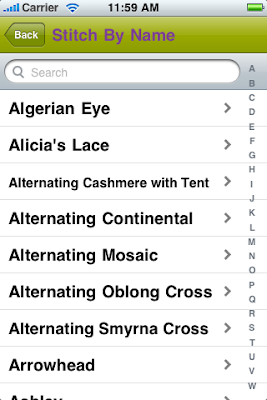 Simply log into the itunes store and search for iStitches or Ruth Schmuff and you will find the app. You can also click here to go directly to the store. Everything works just like it does on the cd. 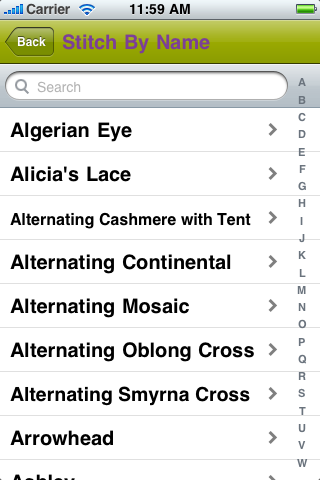 View stitches alphabetically or by type. 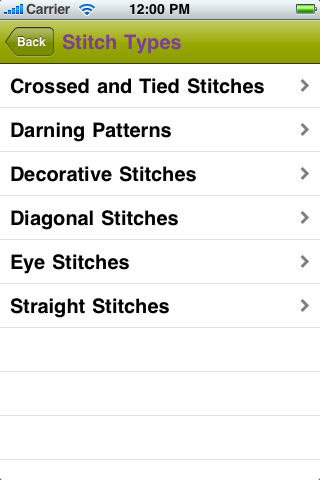 You can now search for a stitch. 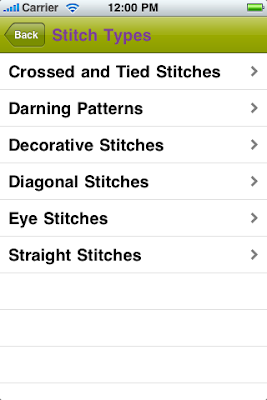 Type in Mosaic and get all the versions of mosaic stitch in the library. 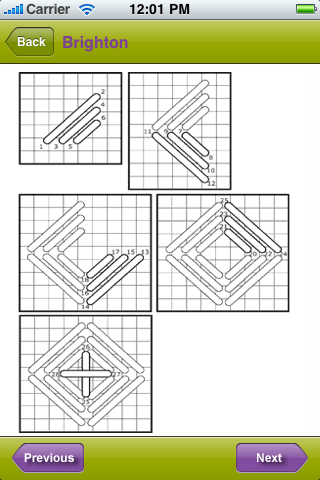 The diagrams are numbered and they do enlarge. Now you can have your stitches with you anytime, anywhere. I hope you enjoy it! YAY! Thank goodness someone is up to date with technology; maybe someday I will catch up to this century too. I've got your wonderful CD's and think it's marvelous that you now have them available as an app! Leave it to you! Cool, but now we need the app for the droid. I must check out the cds in he meantime. P.S. I can finally link directly to you the extra ruthsblog on the url is gone – yippee. woo hoo, the blog is fixed! thanks for letting me know. Check out the cds, they will tide you over until I do a droid app. OK, time to call somebody. I want this, but don't have an iPhone. Do you think this would classify as a good reason for getting one? Thanks for all the warm kudos. Good to know you like how it works. Way cool!! I am anxiously waiting for my 3G iPad to arrive today and will certainly have to add this tool to my Apps library! Are you going to make it available for an Android Phone? That's what I have and I'd love to have the cd for stitches. I concur with Colorado Stitcher. Those of use who are Droid users need an app. Please, please, please! Would love this as a Droid app as well! Love my needlepoint and love my Droid. One more stitcher begging for an Android app! I will add to the Android request!! Would love to use on my htc Droid!!! Another Android Request!!!!! I hope you can develop this wonderful resource for an Android phone!!!!!!!! Please.